Byzantine, Texas: Second volume of OCA Hieratikon now released! Second volume of OCA Hieratikon now released! Already ordered mine. Happy to see they upped the font a tad for easier reading. 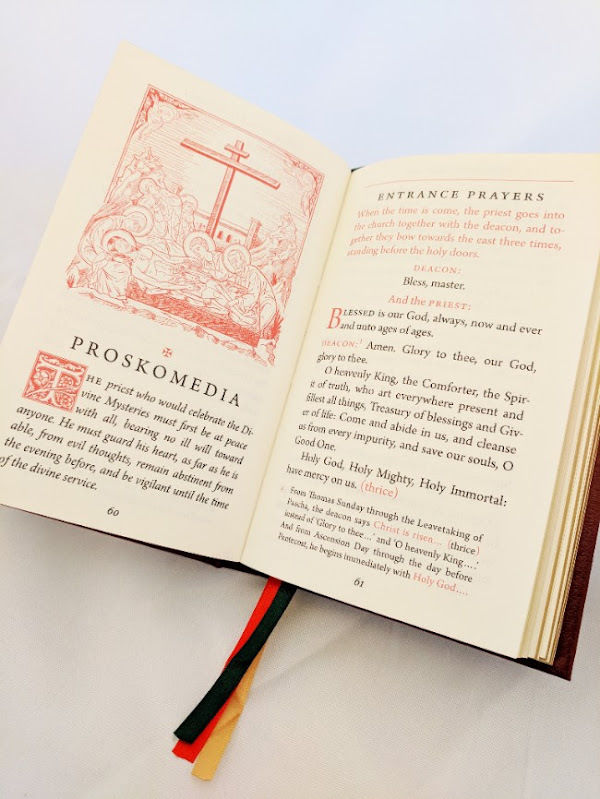 (OCA) - Saint Tikhon’s Monastery Press is pleased to announce the publication of the Hieratikon (Volume 2]: Liturgy Book for Priest and Deacon, edited by Hieromonk Herman [Majkrzak] and Dr. Vitaly Permiakov. The volume includes the full texts of the Divine Liturgies of Saint John Chrysostom and Saint Basil the Great and the Liturgy of the Presanctified Gifts, together with several explanatory introductions regarding hierarchical, vesperal, and paschal Liturgies; the order of censing; and priestly and diaconal concelebration. Appendices include hymns and verses of the liturgical year, various blessings (palms, artos, fruit, herbs, etc. ), and more. “Translations that are faithful to the original meaning are extremely important for the Orthodox, and the editors of the Hieratikon have given us a revised translation of the Liturgies that not only takes into consideration the biblical origins of the texts but also their use in the writings of the Church Fathers,” says Prof. David Drillock, Chair of the OCA Department of Liturgical Music and Translations. Hieromonk Herman is a member of the Brotherhood of Saint Tikhon’s Monastery and a lecturer at Saint Tikhon’s Seminary. Previously he had served for several years as the Chapel Music Director at Saint Vladimir’s Seminary, Yonkers, NY, where he was also a part-time student in liturgical studies. A 2005 graduate of Saint Tikhon’s Seminary, he has done editorial and design work for Divine Ascent Press, Saint Tikhon’s Press, and Wipf & Stock Publishers. Dr. Permiakov is Assistant Professor of Dogmatic and Liturgical Theology at Holy Trinity Seminary, Jordanville, NY. Originally from Riga, Latvia, he holds an M.Div. from Saint Vladimir’s Seminary and a Ph.D. in Theology (Liturgical Studies) from the University of Notre Dame. He is a member of the North American Academy of Liturgy and of the Society for Oriental Liturgies. He has published with Notre Dame Press, Saint Tikhon’s Press and Holy Trinity Publications. The 360-page volume may be ordered online for $35.00 from Saint Tikhon’s Monastery Press or by contacting Priest Innocent Neal at 888-454-6678; INNOCENT.NEAL@STSPRESS.COM. I hope this is better proof read than the last edition of the liturgy book from St. Tikhon's, full of typos. I always chuckle when in the third antiphon it reads “for theirs is the kingdom of keaven” (even more funny as I have a brother named Kevin). I ordered one for my parish priest and one for me. If it's like the first volume, it's a game changer.